The Work It Takes to Teach Your Kids to Cook: Is It Worth It?! The goopy finger reaches into the dough you asked him not to touch. The flour spills. Everyone wants a turn at the same time. The cookbook gets slopped on. The tiny hand grabbing for the spoon knocks over the glass of water. The excitement escalates. An egg gets cracked onto the floor. The smiling kid with cinnamon and honey all over his hands, face, and arms runs out of the kitchen to smear himself all over the couch…. Ah, it’s the picture of parenting bliss. 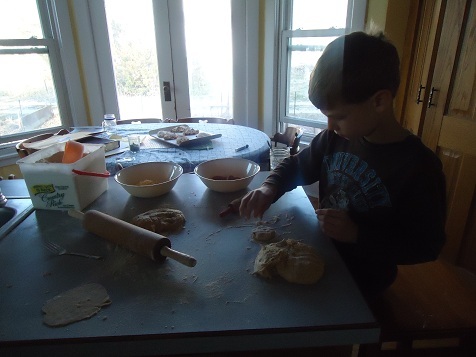 These are the delightful reasons we all love letting our kids help us in the kitchen. Mmm-hmmm. I remember it all very well. I knew the value of getting my kids into the kitchen with me to teach them the basics – plus they always loved helping me. But wow, usually it was so much easier to do it myself. After all, I didn’t need help spilling the buttermilk. I could do that very well all by myself. These are my four boys, back in 2007. I don’t recommend always having all of your kids help you at once, but hey, when it’s Monkey Bread – everyone wants to help. I had one that always walked on and jumped off countertops while helping me. If I remember right, the floor was made of hot lava. Elias, please be careful with that vanilla you’re sniffing. It’s too precious to spill. Sitting on the countertop was also a very effective way to reach the bowl. Oh look, here they are making Snowflake Quesadillas. The little cuties. It’s great to look back at pictures of the kids and forget that what was really happening when I snapped the shot was that the five year old had his pants on backwards, the two year old was in the background screaming, and the other quesadillas were on the stove burning. My encouragement to you is this: If you continue to let your kids into the kitchen with you, teaching them basic skills and letting them do what they are able to do – your hard work WILL pay off. Now, all I have to do is hand my 11 year old a recipe and he can make it on his own. Now all I have to do is ask my 13 year old to brown hamburger meat for lunch, and he has it done in 15 minutes. Now all I have to do is ask my 8 year old to get the eggs ready for breakfast and he knows just what to do (except for the actual cooking part – we’re still working on that one). Now I can turn parts of our meal over to our 16 year old and he’ll take care of them completely. 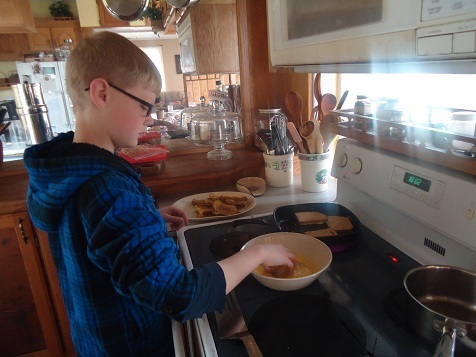 My kids still have a lot to learn, but they’ve spent a lot of time helping me in the kitchen through the years, which has made learning to cook come more naturally to them. 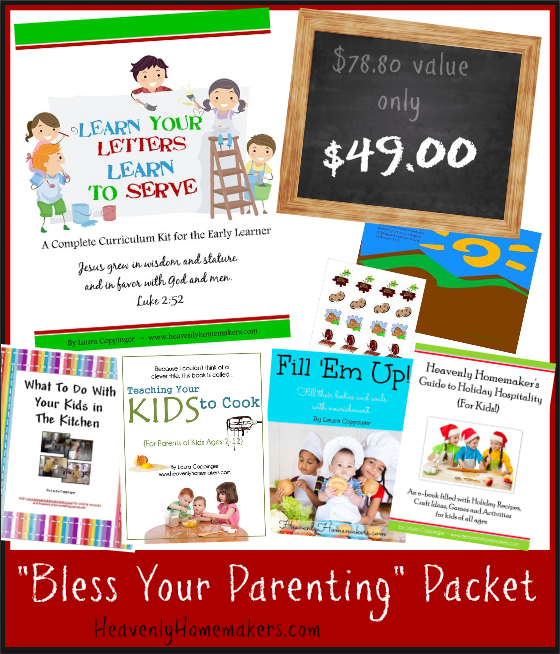 “Bless Your Parenting” Packet ~ $78 value just $49!! Hi Laura! I so enjoy your website; thanks for sharing all your lessons and ideas. Just yesterday as the 4 kids (10 – 18 yrs) helped me in the kitchen, I was struck by the fact that I’ve only trained them to follow my commands – I mean instructions — but they still can’t independently cook or bake anything much. I can see now that I’ve not been a very good teacher in the kitchen. This bundle of books — would it be of help to me at this stage or do you think the books are meant for much younger children (rather than 10, 12, 16 and 18!) Any other ideas or advice? I will look into that; thanks Laura! No offense to Laura (I DO love your ebooks Laura! ), but your oldest 2 especially might benefit from a book called “Help! My Apartment Has a Kitchen!” by Kevin & Nancy Mills. It’s been my favorite cookbook for years. I learned most basic cooking skills from my parents, but didn’t realize that I didn’t really know how to put a meal together (or make anything that didn’t come from a box) until I lived on my own for the first time. My mom gave me this cookbook and it started me on the road to true from-scratch cooking. That does look like a great book, maybe for a Christmas gift for the 18 year old this year! Thanks for the great idea, Anitra! Oh, thank you. I needed to read this. It. is. so. hard. My kids love to make messes-I mean cook-with me in the kitchen, and I have a really hard time letting them. I do more than I used to, but I feel like it isn’t enough. My oldest tried to melt chocolate chips once by using the toaster…ever woken up to the smoke detector going off on Mother’s Day? Bless her little heart, she was trying to make a special breakfast for me. I may have to invest in the Learn To Cook ebook! Hey, we have hot lava floors at my house, too! 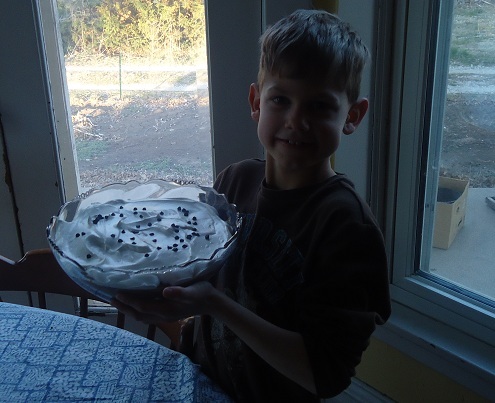 Needless to say, we also have a 10 yr. old boy (who also loves to help in the kitchen, so thank you for this post!) We picked blueberries in late June, and he was determined to bake muffins all by himself. “I don’t want you to help me, AT ALL, mom!” I agreed only to answer any questions, and he did great! The best part is that he is a picky eater who will eat something that he himself has helped make, so a definite plus! And your future daughter in laws will thank you very much that their husbands can hold their own in the kitchen! Thanks for the reminder and encouragement! My kids are 5 and 2, both love to help out (especially with any kind of baked goods), and I try to remember that it’s worth the messes & headaches now for the reward later! Lovely piece, and nice to see the before and after photos to give heart to parents who are still in the mucky and trying end of the process. While you think you should teach your children these skills for THEIR sakes, it’s heartening to see evidence that it can eventually have a benefit for YOU as well, when they can pitch in and help with family meals. I’ve just got mine (9 and 11) to the point where they come in from school and if there are no snacks in the house they have three or four recipes each that they have practised with me many times, and now they will just get on and bake them for themselves, without my help. They will also both get a loaf started in the bread machine if we are running low. It’s a real tipping point. My subscribers are mostly parents of under 8’s getting started with cooking and growing, so I have shared this post with them, as it’s inspiring to see someone on the other side of the tipping point. So many thanks for sharing your photos, it will give them heart! My 2yo is wearing that same shirt with jeans today, lol!